Home/Fifa Gossip/Is the improving San Jose State gaining any ground in the Mountain West? In 2009, the Mountain West had one of its best seasons on record. TCU went 12-1 and finished sixth in the AP poll, BYU went 11-2 and finished 12th, and Utah went 10-3 and finished 18th. 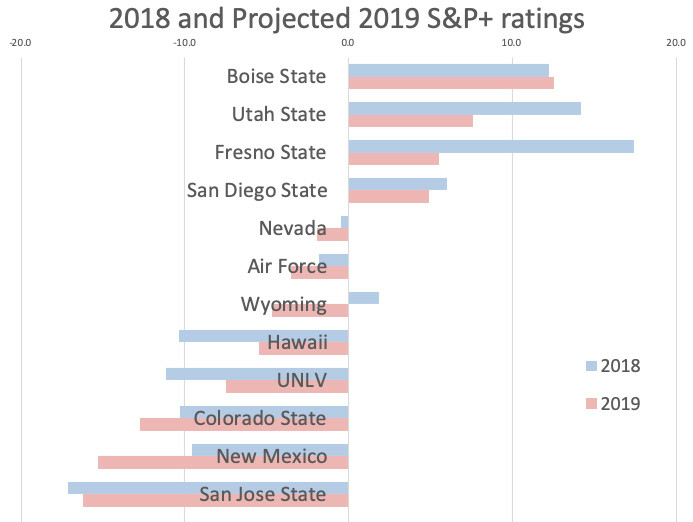 The conference’s average S&P+ rating was a healthy minus-0.3, only about a touchdown behind the Pac-12, which had finished with only one AP-ranked team. To make things even better, Boise State — the only team to beat TCU in 2009 — announced it would be joining the MWC as well the following summer. Just a week later, however, Utah accepted an invitation to join the Pac-12. BYU would soon go independent, and the next year, TCU would accept the Big 12’s invitation. 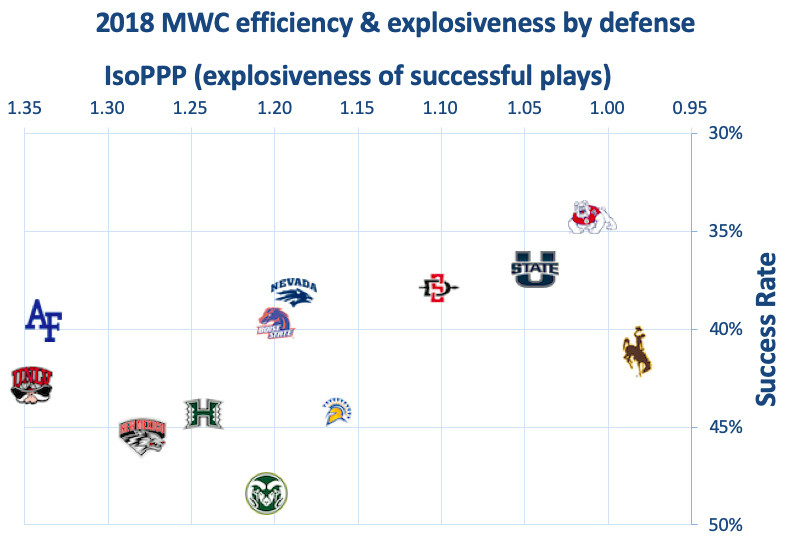 From 2011-16, the MWC’s S&P+ average was around minus-5 or 6, and then it fell to minus-7.1 in 2017. Adding Fresno State, Utah State, and San Jose State from the collapsing WAC did nothing to stem this tide. In 2018, however, everything turned around. After five straight years in the 30s, Boise State jumped to 28th in S&P+. Fresno State leaped from 81st to 16th and won the conference. Utah State stayed reasonably healthy for once, surged from 83rd to 21st, and won 11 games for the first time since 2012. Nevada jumped almost as far, from 119th to 77th (and from three to eight wins), its first top-80 finish since 2012, Chris Ault’s last year in charge. San Diego State lost star running back Rashaad Penny but still improved from 54th to 47th. Wyoming lost a top-10 draftee at QB and improved from 79th to 69th. The MWC ended up with an average S&P+ rating of minus-0.8, easily its best since the high-water mark set nine seasons earlier. Recent hires like Fresno’s Jeff Tedford and Nevada’s Jay Norvell lifted the profile, while stalwarts like Boise State’s Bryan Harsin, SDSU’s Rocky Long, USU’s Matt Wells (who left and was replaced by Gary Andersen, a former 11-game winner at Utah State), and Wyoming’s Craig Bohl kept their ships steering straight. 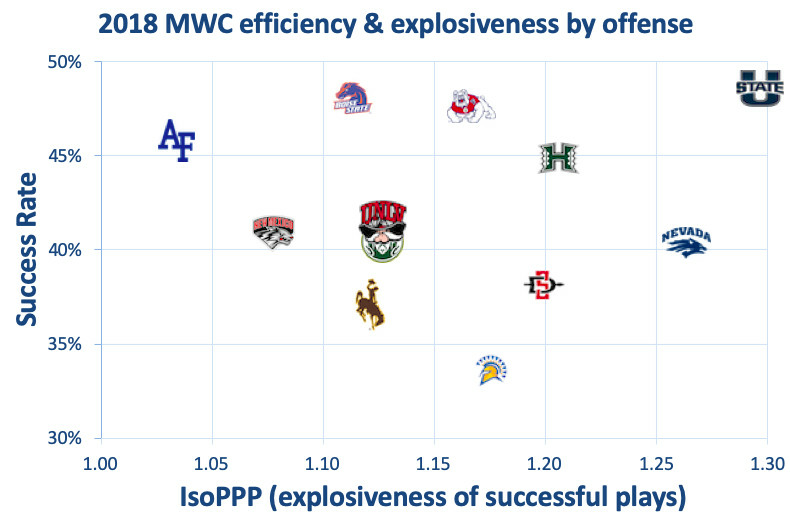 This appears to be a great time for the Mountain West. One problem: someone still has to lose conference games. In Brennan’s second season, his Spartans improved their S&P+ rating from minus-20.0 to minus-17.1, from 125th in FBS to 115th. But they went from 2-11 to 1-11. They could throw the ball a little bit and defended the run quite well, and after losing nine games by 21-plus points in 2017, they did so only three times in 2018. And yet … 1-11. A longtime assistant at Cal Poly, SJSU, and Oregon State, Brennan had to know he was taking on a hard job. What he maybe hadn’t banked on was his new colleagues making his job even harder. Quarterback Josh Love does return, but the Spartans have to replace four of their five or six best defenders, including key run-stuffing linemen Bryson Bridges and Boogie Roberts. The experience is still pretty good on defense, but from an overall returning production standpoint, this appears to be a lineup destined to hold steady, not improve, and definitely not improve enough to catch up to the Joneses. Brennan has to hope that his culture can propel the program forward. It has happened plenty of times in college football — hell, Mike MacIntyre had won just six games in two years at SJSU before the 2012 breakthrough earned him the Colorado job — but the odds are never in favor of it. Here’s one good thing I can say about Kevin McGiven’s first season as SJSU’s offensive coordinator: he played to the Spartans’ strengths. Or at least, he played away from their weaknesses. A former coordinator at Montana, Utah State, and Oregon State, McGiven doesn’t have a ton of success on his résumé, but he did improve OSU’s offense from 86th to 59th in Off. S&P+ in his last year in Corvallis. That success was based mostly around an efficient ground game. He found pretty quickly that that wasn’t an option last year. 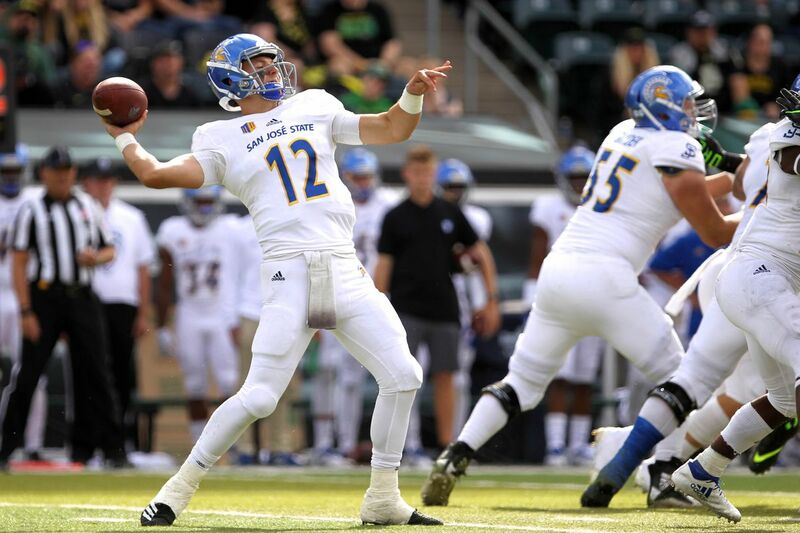 SJSU threw as much as just about anybody — 126th in standard-downs run rate (47 percent), 108th in passing-downs run rate (27 percent) — and that made sense. The Spartans had, per S&P+, the worst run game in the country. They were 130th in Rushing S&P+ and 129th in both rushing marginal efficiency and rushing marginal explosiveness. For every eight (non-sack) rushes, Spartan ball-carriers gained at least four yards on only three of them and got stuffed at or behind the line twice. Gross. Only one running back gained more than 200 yards (Tyler Nevens, with 554 in nine games), and while he returns, along with four starting linemen … well … let’s just talk about the passing game. Forgoing the run meant Love could take shots downfield. He completed just 52 percent of his passes on first down, but averaged more than 17 yards per completion. And his two best big-play threats return. They’re the only returnees among last year’s top seven targets — and if you’ve read these previews for a while, you know that continuity in the receiving corps has a big impact on whether you improve or regress — but they’re the right two, at least. Junior Tre Walker didn’t play in three games and ended up with just 58 targets to departed tight end Josh Oliver’s 104, but he still had the most receiving yards on the team. In the last five games, he caught 29 passes for 524 yards and five touchdowns. He could be a 1,000-yard receiver, easy. There’s a nice base for a passing game. But you theoretically need more than two receivers, and it’s unclear who else might be ready to catch passes. Leki Nunn and JaQuan Blackwell (a star of the 2019 spring game) combined for 19 catches for just 147 yards, and redshirt freshman Jermaine Braddock was a mid-three-star prospect but was targeted just once. Brennan really wants to get the tight end position involved, and with Oliver gone he signed two JUCOs (Jackson Burrill and Derrick Deese Jr.) and a three-star freshman (Dominick Mazotti). Oliver was an extremely frequent target but averaged just 6.8 yards per target; in theory, one of these three (or junior Billy Humphreys) can match that. Brennan chose another former Oregon State colleague, former Beavers DBs coach Derrick Odum, to run his defense two years ago, and it showed a few signs of life last fall. In one area, anyway. 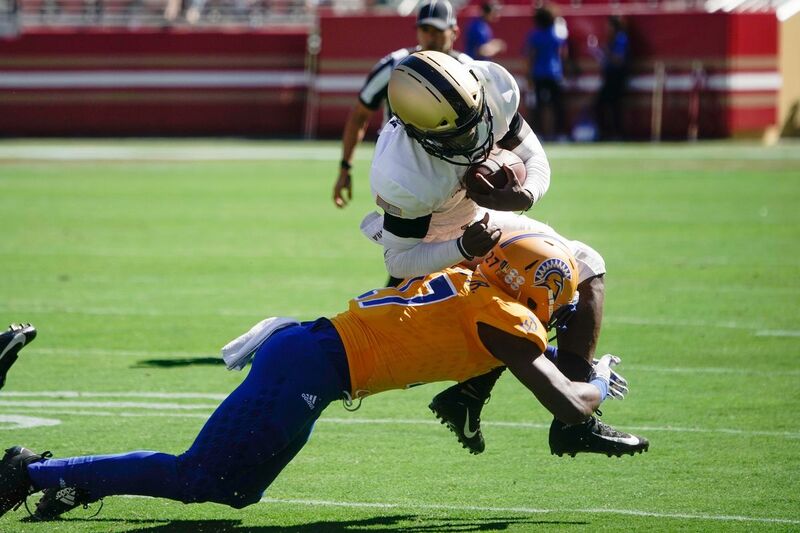 SJSU ranked 51st in rushing marginal efficiency allowed and 71st in overall Rushing S&P+. 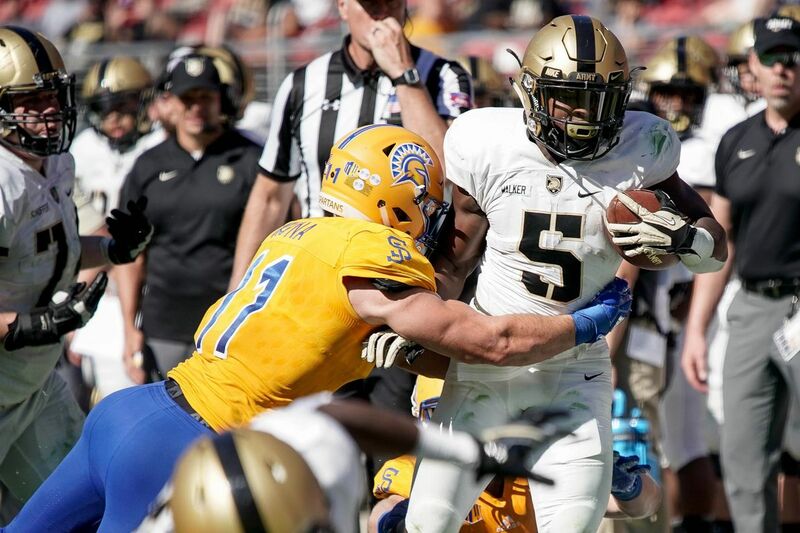 The Spartans were able to render opponents one-dimensional at times, and they were excellent in the red zone — 51st in success rate between their 11 and 20, 63rd inside the 10, 10th on the goal line. They bring back seven starters, but you do fear that two of the four losses will be particularly costly. End Bryson Bridges and tackle Boogie Roberts combined for 16.5 tackles for loss and 24.5 run stuffs; they were second and third on the team in the former category and first and second in the latter. Getting a full season from monstrous tackle Sailosi Latu will help mitigate those losses a bit. The 334-pound senior played in only four games last season but did a good job of occupying blockers in 2017. End Cade Hall might have a decent pass-rushing presence (he had 4.5 TFLs and three sacks as a freshman), but the keys to continued run success might be linebackers Jesse Osuna and Ethan Aguayo. Osuna is the Spartans’ best returning defensive player, and maybe by a wide margin. He’s not used in the pass rush all that much (nor is Aguayo), but with 10 TFLs and 10.5 run stuffs, he is the best player when it comes to forcing pass rush situations. If Hall turns into a stronger and stronger pass rusher as he matures, that could go a long way toward solving the defense’s biggest problem. 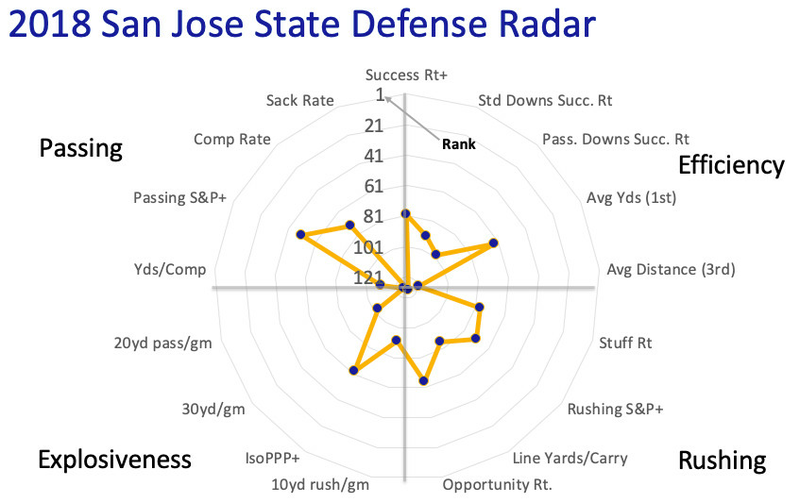 SJSU was 130th in sack rate last fall, which put an interesting but inconsistent secondary in a tough spot. Cornerback Dakari Monroe was dynamite on the ball — he had four interceptions and 15 breakups — but he had to be because quarterbacks weren’t throwing stressed passes. Monroe and fellow corner John Toussaint are gone, but there’s still hope at the position. Junior Tre Webb returns, senior Zamore Zigler had flashes of success after converting from running back, and, most importantly, sophomore Nehemiah Shelton showed major potential before missing the final nine games. 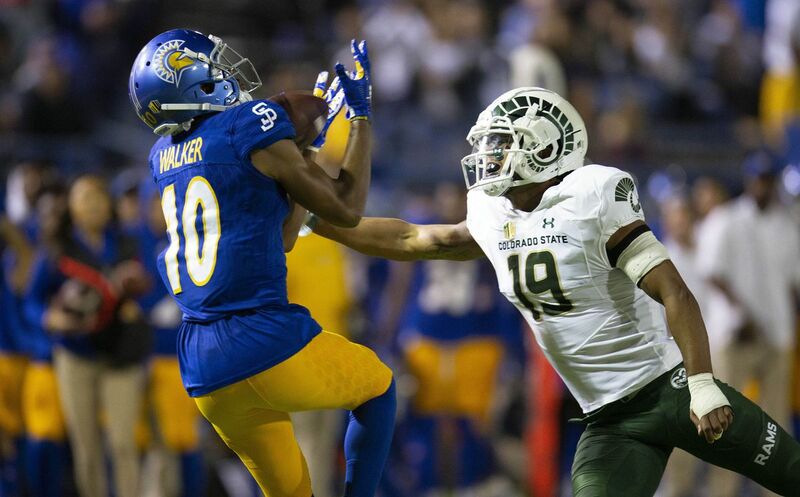 At safety, SJSU gets senior Chandler Hawkins back — he was lost for the season one game in (seriously, among all their other problems, the Spartans were wrecked by the injury bug last fall) — and returns a nice play-maker in junior Jonathan Lenard Jr. He was fourth on the team with 5.5 TFLs and fifth in passes defensed with five. He’s a free safety, but the closer to the line of scrimmage he is, the better he plays. He’s a linebacker in a safety’s body. 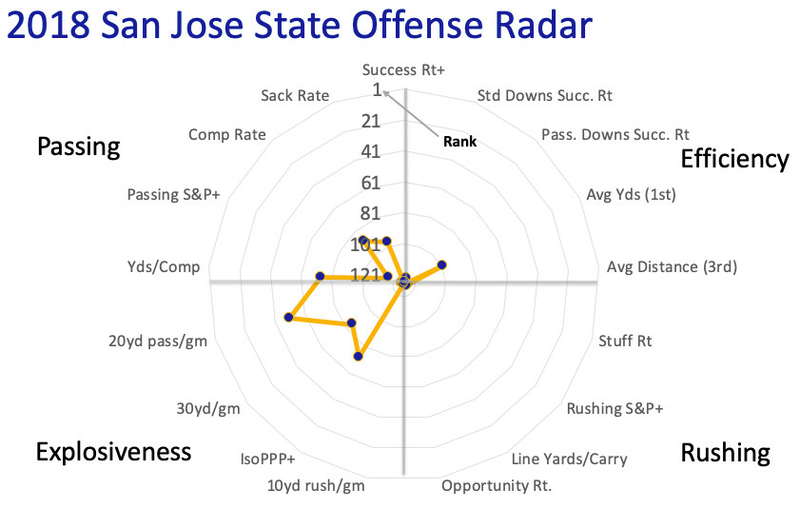 SJSU fell from fourth to 64th in Special Teams S&P+ last fall, but that still made it a relative strength. Unfortunately, 2019 brings a total restart here. Losing Bryce Crawford means losing your place-kicker, kickoffs guy, and punter, and losing Thai Cottrell means losing your chief kick and punt returner. Zamore Zigler and Bailey Gaither both have return experience, but the legs are new. Perhaps punter Alex Galland, a Yale grad transfer, can stabilize part of the unit. Yale to SJSU. That’s quite the culture shock there. Before this year’s spring game, SJSU athletic director Marie Tuite announced plans for a $40 million facilities upgrade. The Spartans are trying to make up ground on the rest of the conference, but it’s going to remain hard work. After stripping everything down to the studs, Brennan showed progress in at least a couple of areas last fall. If he’s building a sturdy culture, we should see proof of it this fall, but the glimpses will probably be fleeting. Even if the Spartans overachieve and play at more of a top-100 level than bottom-15, they still face four opponents projected 54th or better, and they still go on the road to face five other projected between better than 100th. S&P+ projects them as a favorite just twice and a one-possession underdog just once. Still, when you’ve won only three games in two years, you can show clear improvement simply by going 3-9. If the Spartans can beat Northern Colorado and Tulsa to start the season, they’ll show a smidge of proof. See where it goes from there.